The Orange County Hiking Club helps "at risk" youth connect with nature. This model program helps at-risk youth and receives high praises from the community and agencies. Across the United States there are thousands of at-risk youth that have been pulled from their homes. 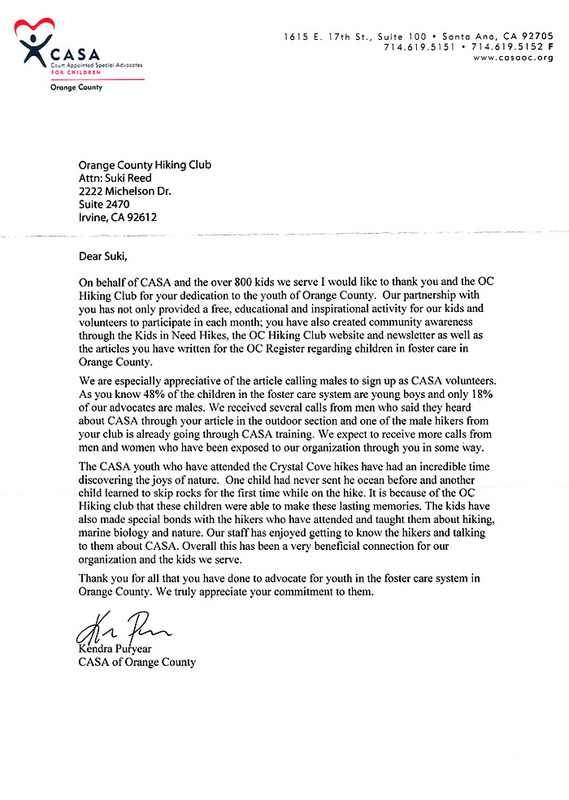 The OC Hiking Club works with at-risk youth of all ages from local and national agencies including: CASA, GRIP, SOY, Orangewood Foundation, Foster Care Auxiliary and others. We connect at-risk youth with the outdoors on local walks and hikes. These magical hikes take children out into nature in a supportive social environment. Time spent in nature is highly beneficial and creates lasting positive memories (read “Last Child in the Woods” www.richardlouv.com). Additionally, studies show that even a small amount of positive adult attention can make a big difference in the life of a child. Each trip is headed by an OC Hiking Club Hike Organizer with a background check. The youth are accompanied by staff or adults from the accompanying agency. More than 70 percent of all state penitentiary inmates have spent time in the foster care system. 1999/2000 Grand jury reports show that within 12-18 months after leaving the foster care system 27 percent of males and 10 percent of females had been incarcerated. Our goal is to raise community awareness of the need within our local Orange County area and to help deserving kids connect with the outdoors. If you wish to attend a Kids in Need of Nature hike please join the club and read the event text carefully. A background check is required. "Crystal Cove is so beautiful and close by — can we come back here again?!" "I can't believe that was six miles — it didn't feel that long!" "I can't wait till the next hike! I'm definitely going." "I spent part of the walk with a woman who was single and successful; it was really encouraging to talk to her. I'm not so afraid." Stay with the Hike Organizer and members who know the route. Know and follow the rules established for these events. Bring a sun hat and sunscreen. Comfortable shoes with traction are advised. Tennis shoes are acceptable. Dress appropriately for the weather: loose, comfortable clothing with wicking capability and layers for temperature variation is recommended. Bring MORE than just one bottle of water. "Many of these children, who have been removed from their homes due to chronic or severe abuse, will never return home again. Their only "crime" is that they have been victims, and they now face the possibility of becoming lost in an overburdened system. These kids need advocates to speak up on their behalf. 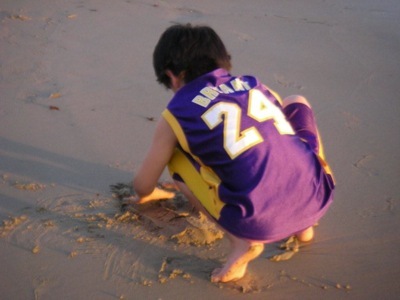 There is a waiting list of children who are in need of just one special person." Orangewood Children’s Foundation is a private, nonprofit organization founded in 1981 and one of the leading providers of services to children in foster care. Through financial assistance, mentors, daily living skills workshops, transitional housing and college scholarships.